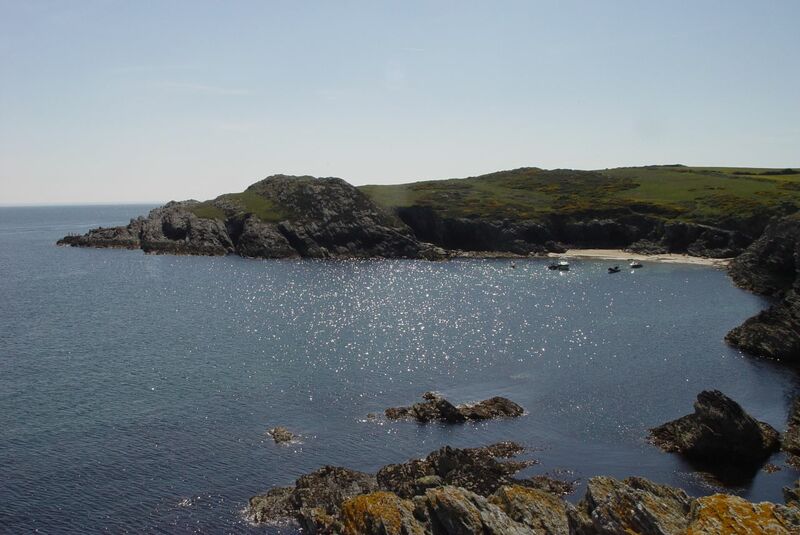 In June 2013, Sarah and I went to stay for a few days in one of our favourite places on earth, Anglesey. 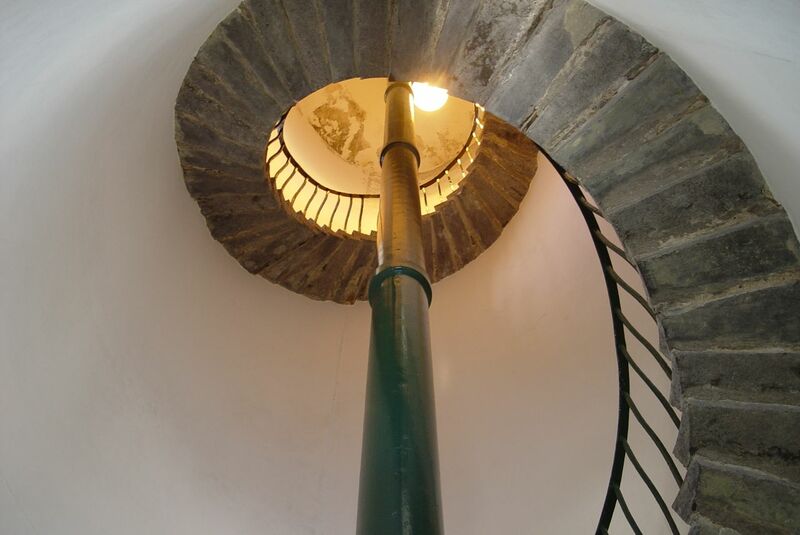 In this first post about our visit we manage to get into a place we have long admired, the South Stack Lighthouse. 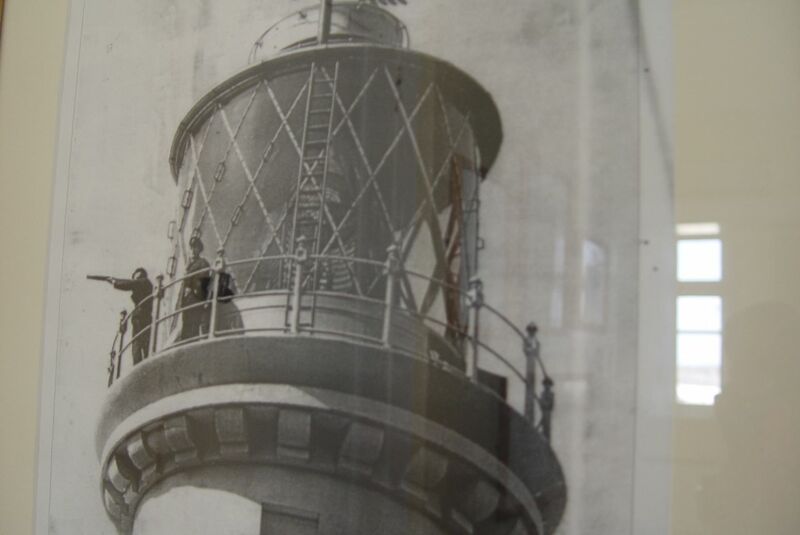 The post, as you will see, features a man called Gordon Medlicott, amongst the last of the Lighthouse Keepers here before all of the UK’s lighthouses were automated up to 1998. In fact all lighthouses have fascinated us both for years. On our travels up and down the west coast of Britain we have always made detours to go and look at them. 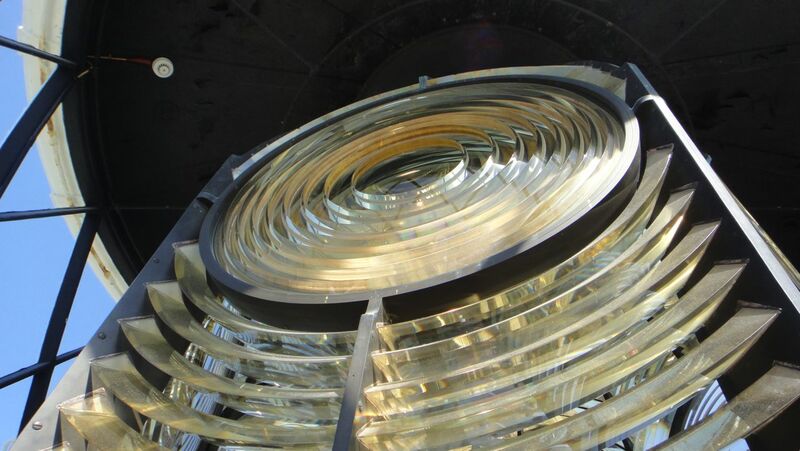 And I remember once when we were in Cornwall going specially to Penzance to visit the National Lighthouse Museum, only to find it had recently been closed down. Imagine my delight then, when one Sunday in March 2014, I received an email from Gordon Medlicott, the Lighthouse Keeper featured here, saying how much he’d enjoyed the post. With Gordon’s agreement some of his words are now included at the end of the piece. 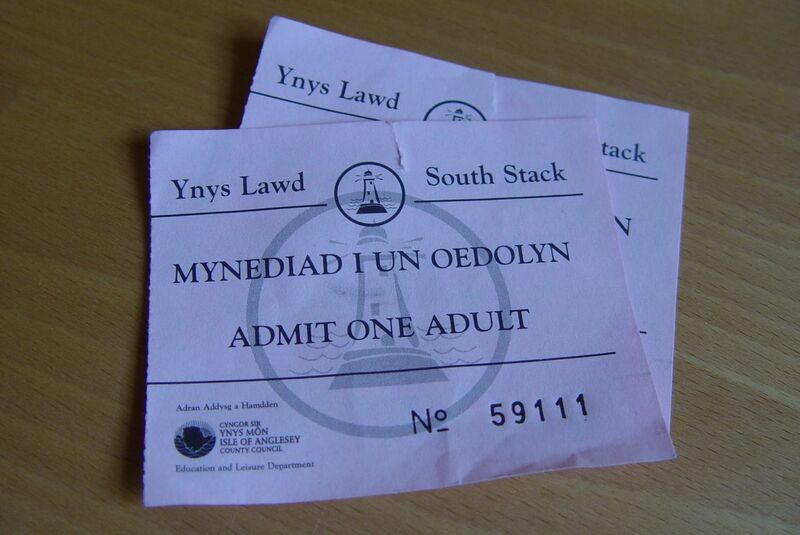 After all, it’s not every day you hear from a Lighthouse Keeper! Here in Liverpool on a grey, partly rainy Tuesday our blue, sunny weekend on Anglesey seems a world away already. But full of photographs, memories and opinions, we have lots to say about what we found, and will both be doing so in a few linked posts this week. 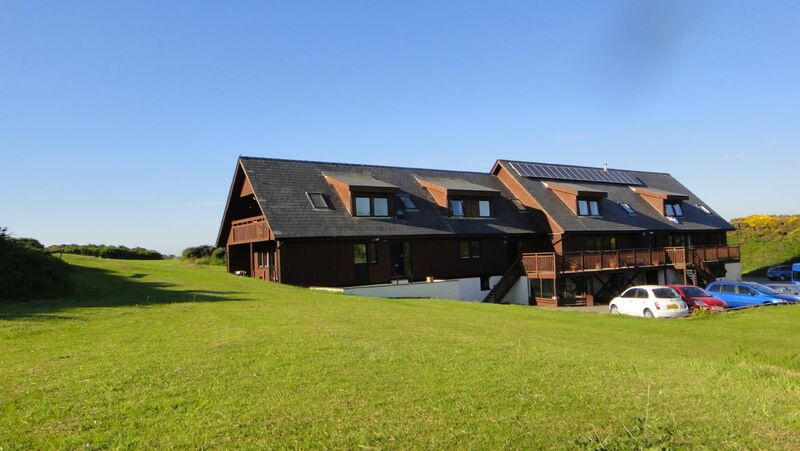 We stayed here, Anglesey Outdoor Centre. Idyllically situated by beautiful Porth Dafarch beach, Sarah was soon painting. 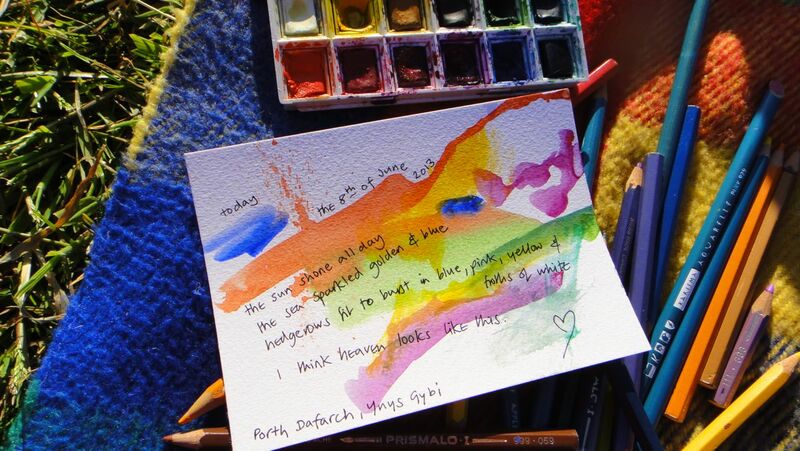 More art to come in Sarah’s soon coming ‘Wildflowers of Anglesey’ post. 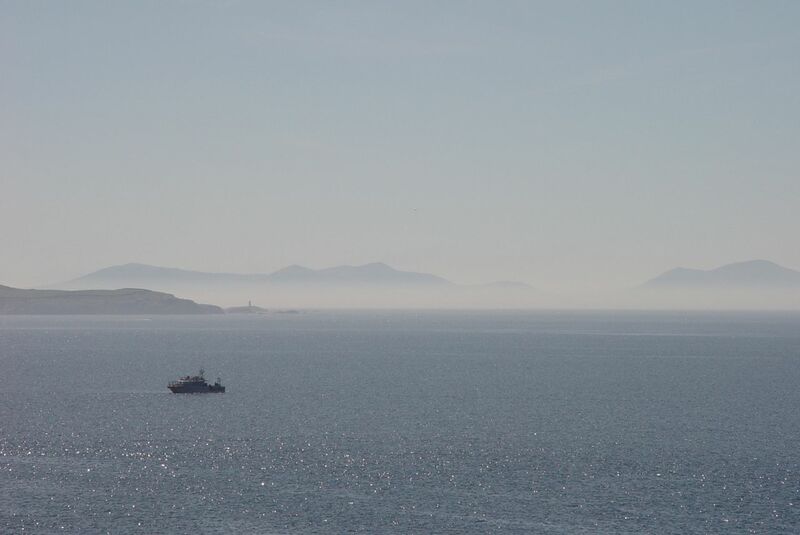 ‘I think heaven looks like this.’ Off in the distance Snowdonia hovering in a heat haze. 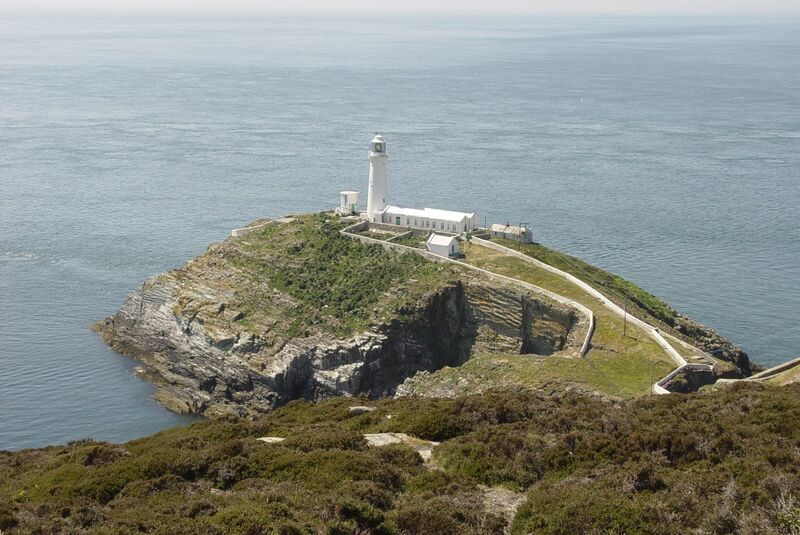 We spent most of our time on Ynys Gybi, the smaller island off the tip of Anglesey, and the majority of our time there exploring the heathlands and cliffs leading up to South Stack. And there’ll be much about that on Sarah’s Wildflower post. 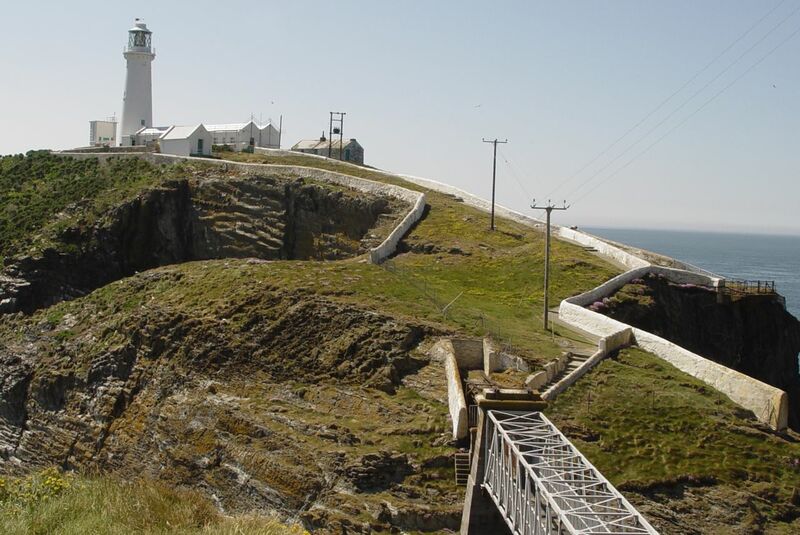 For now we’re going to visit one particular feature of South Stack, its lighthouse. 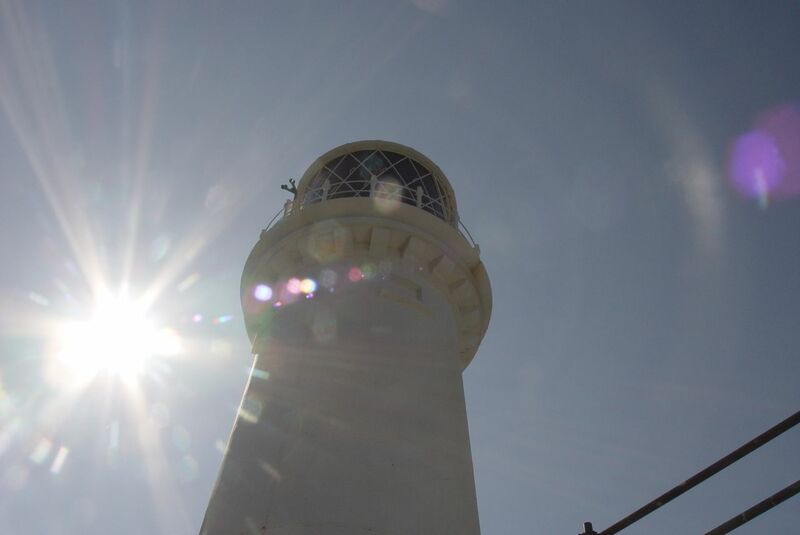 We’ve looked at the Lighthouse several times before, coming to South Stack to see its huge colonies of nesting birds, particularly guillemots and puffins. 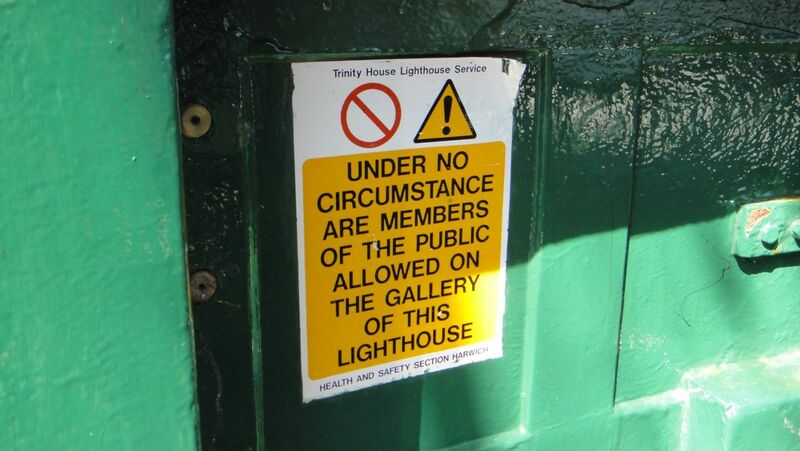 But the Lighthouse has never been open for us to go in. This time it is and Sarah persuades me to go and have a look. Persuades me? Yes, it’s so visually perfect I was reluctant to have it spoiled by any kind of ‘Visitor Centre’ blanding out experience. I needn’t have worried as it turned out. 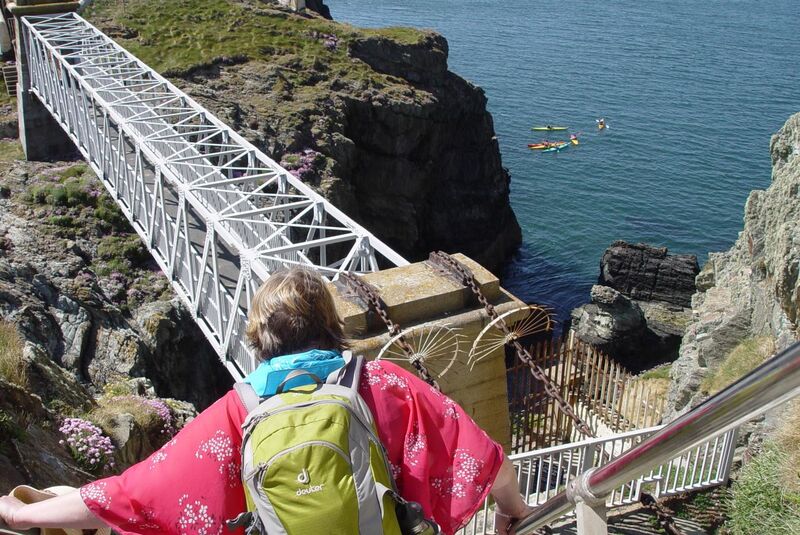 First of all it’s down the 400 or so steps carved out of the rock face to get to the bridge across to Ynys Lawd, the tiny island where the Lighthouse is. 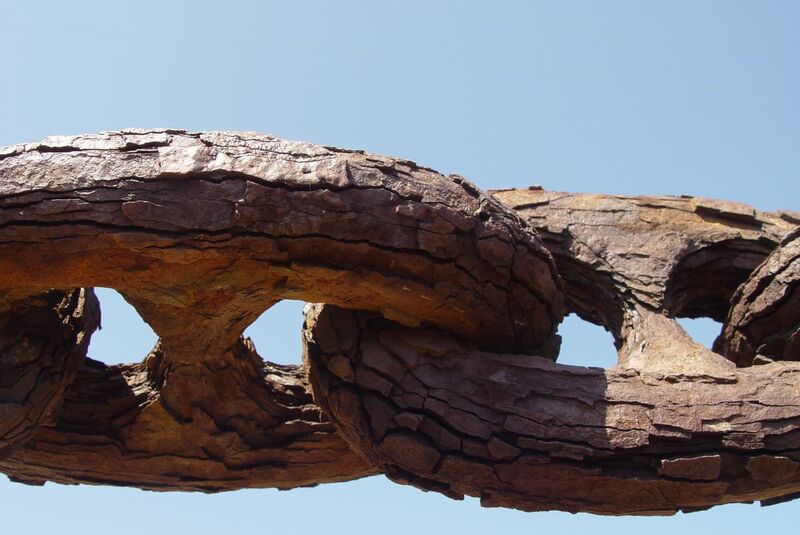 Those bridge chains up close. We cross the bridge to Ynys Lawd. 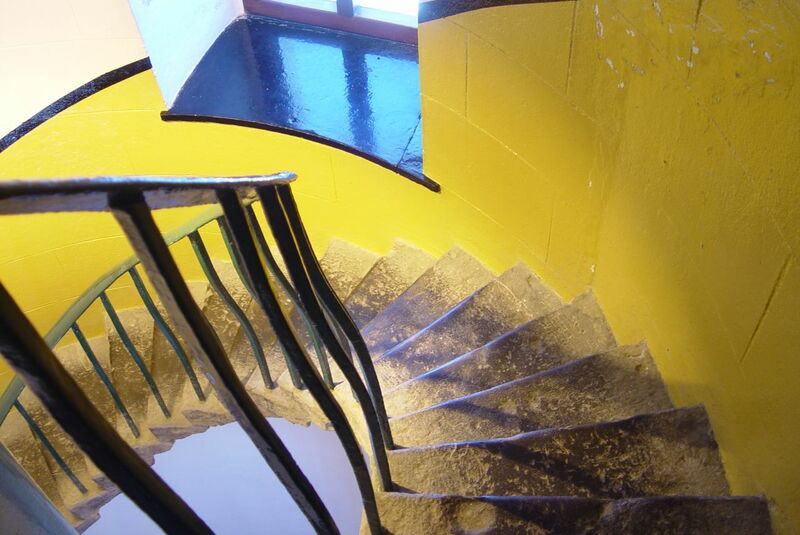 There’s a good history of the Lighthouse at this link, so I won’t re-tell it all here. 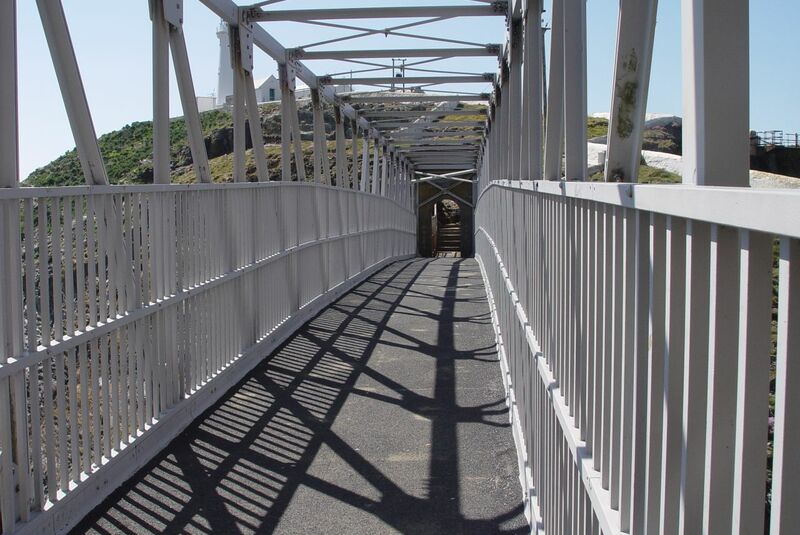 But as we walk on to the island we’re walking into a miracle of engineering from over 200 years ago. Built by hand in seven months. The winding platform used to pull up supplies from boats. Ancient steps down to the boats, no longer in use. And I’m no geologist but I can tell there’s something very special going on here in these folds of 500 to 700 million year old rocks. But now – To the Lighthouse. 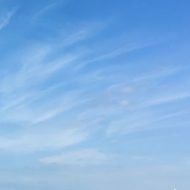 I love lighthouses. I’ve gazed at them and read about them for years. 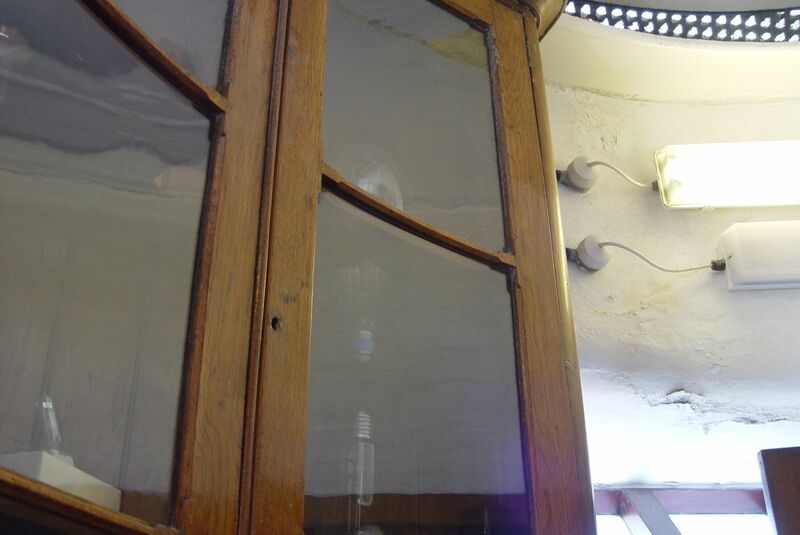 But their doors are mostly closed now, their lights operated remotely, rather than by small teams of doughty lighthouse-keepers. So I’m about to enter the first lighthouse of my life. And there is a bit of a visitor display, but it’s quietly done. 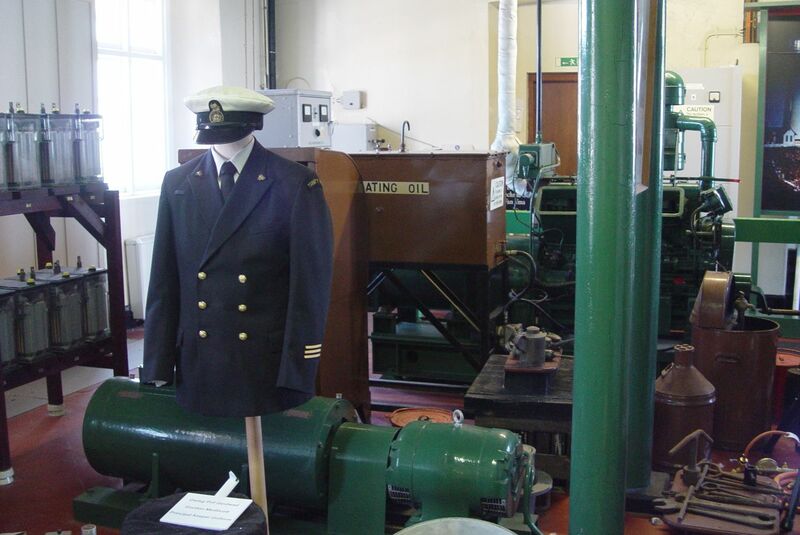 Including the uniform of Gordon Medlicott, one of the later lighthouse keepers to work at South Stack before it was mechanised in 1984. And here, Gordon Medlicott himself. Lighthouse keeper and brave man. And yes, the light, that’s where we want to go. Past the built in curved cupboards. The wonders of its mechanism are explained to us. The light held steady, in a lighthouse designed to move in the wind, on a bed of mercury. A sense of wonder, the only adequate response to such skill and ingenuity. And of course we want to go out there next. Using this lovely hand-shaped handle. So we gaze around at all points. 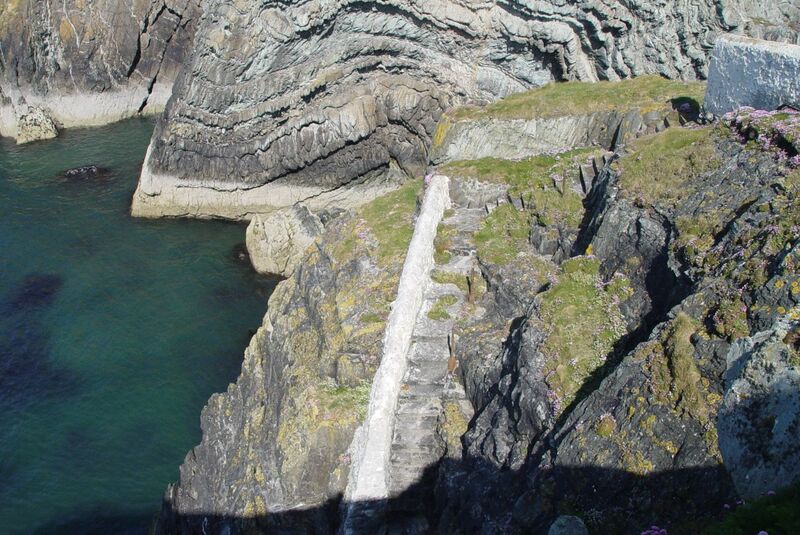 Here seeing the zig-zagging cliff steps we’ll have to walk back up before too long. And a bit more history. 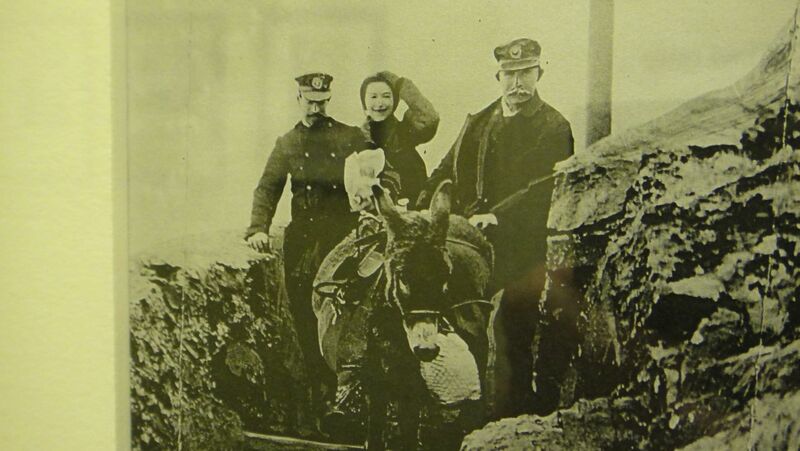 Early twentieth century porter services down the steps from Tommy the Donkey. Classic illustrations of birds around here by C.F. 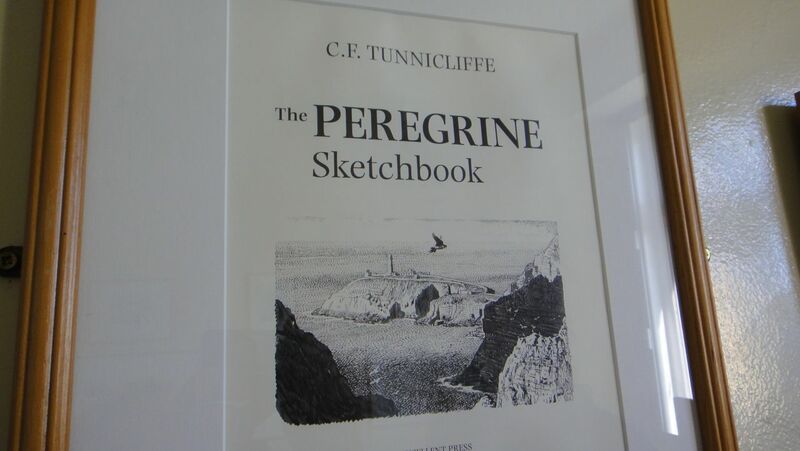 Tunnicliffe. Their families too, when families lived here and babies were born on the island. 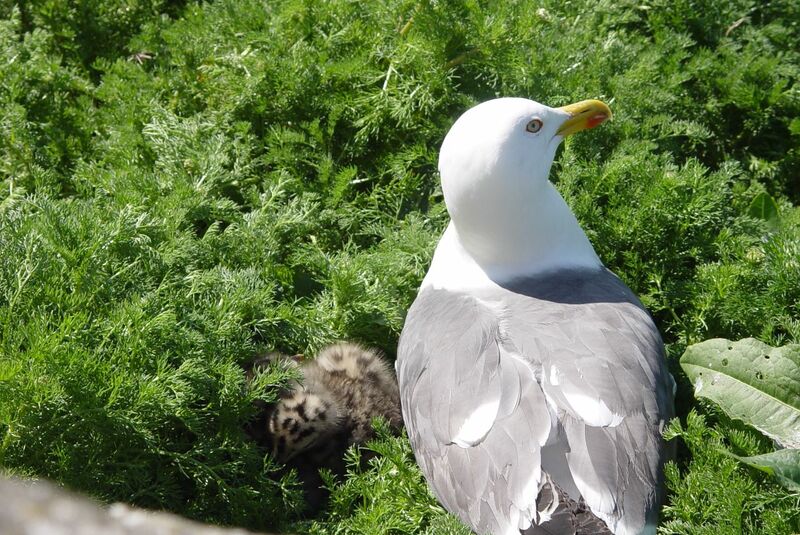 But from 1935 that was stopped and the keepers worked one month on the island and one month off, with their families. 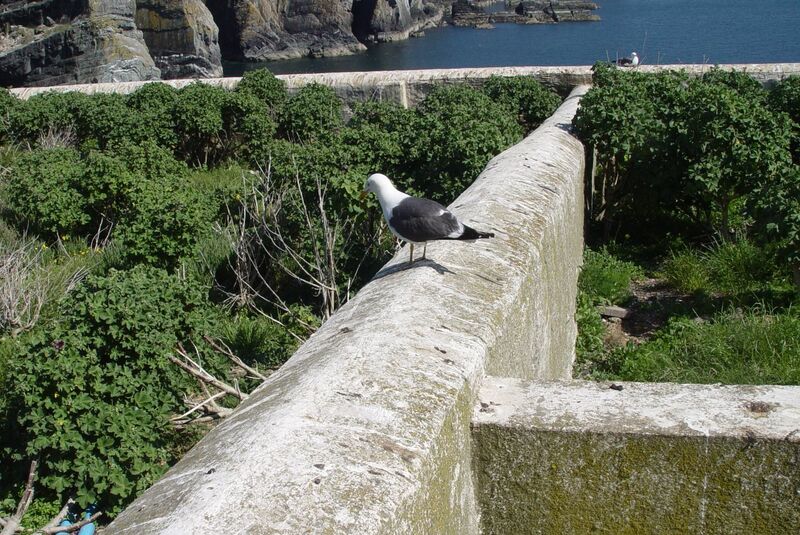 They would grow some of their own food here in the walled plots now colonised by gulls. 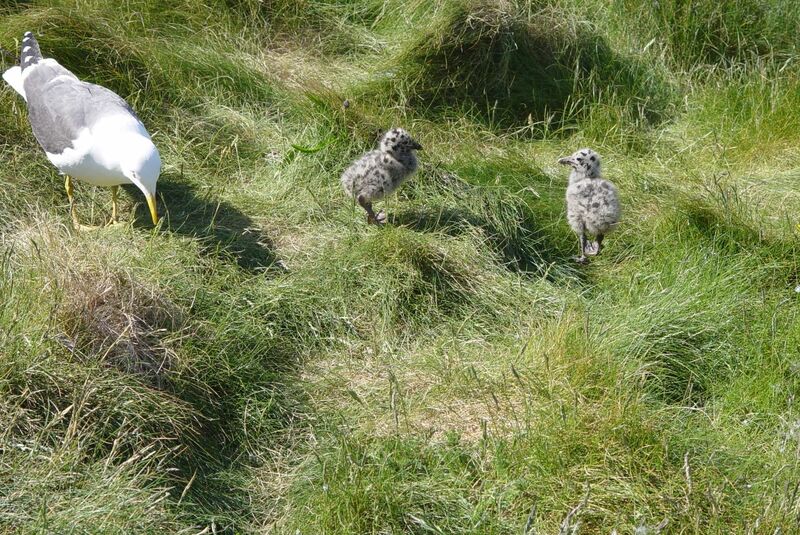 Talking of which, any small fluffy baby gulls to show you? We were the last to leave, other than the 3 staff looking after all the visitors. And we left reluctantly. This is a wonderful place. 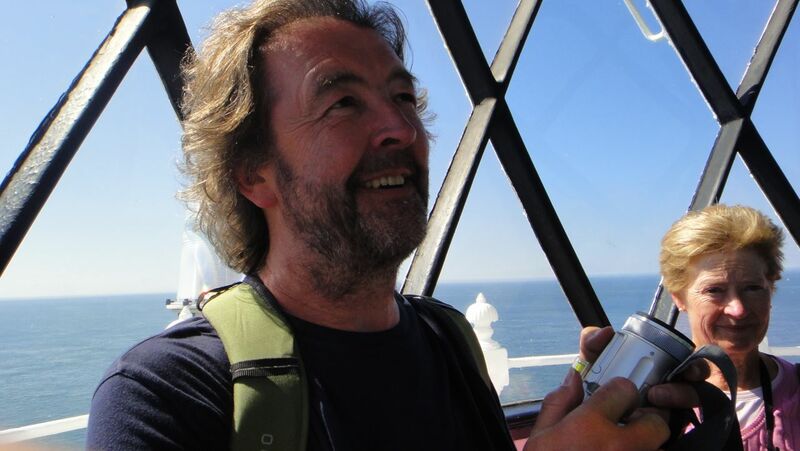 So we arrive at March 2013 and Gordon Medlicott, the featured South Stack Lighthouse Keeper writes to us. 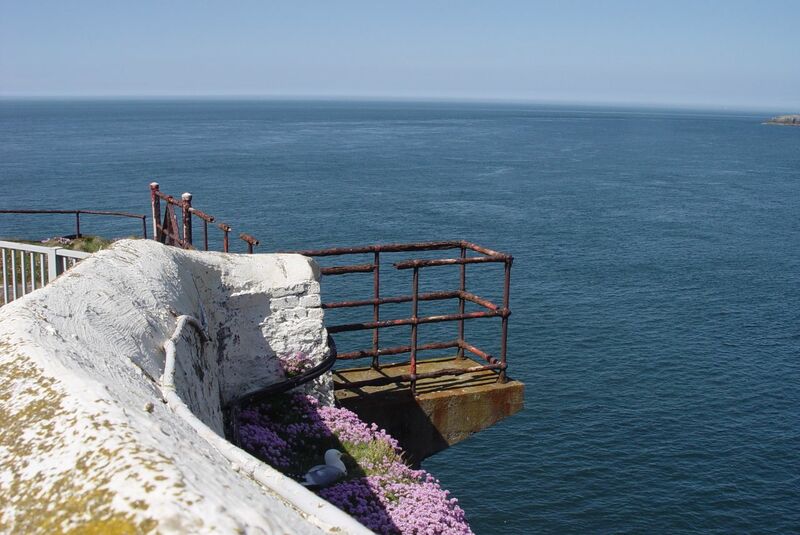 “Only just come across your site.Many thanks for the pictures of South Stack lighthouse, very nostalgic. Brought back many memories of my time there, especially with the link to the Post article covering the rescue. I am hoping to revisit there later this year. 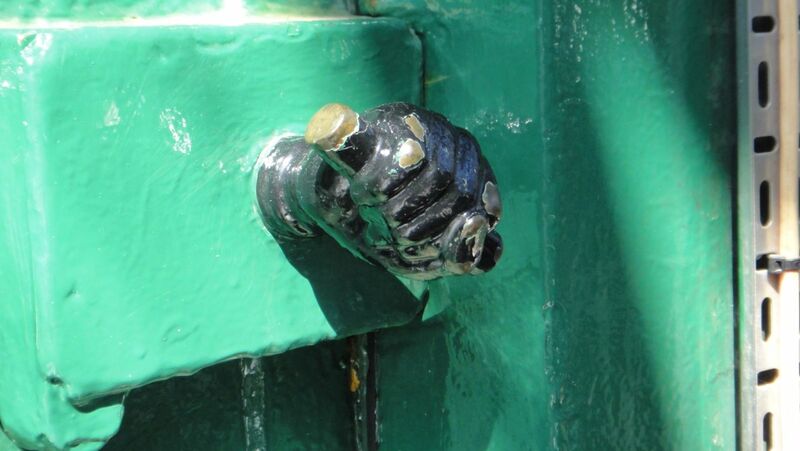 “Delighted to hear from you and glad you enjoyed our blog post. Though it was from nearly a year ago I recognised your name as soon as I saw it in the in-box. First email I’ve ever had from a Lighthouse Keeper as you’ll probably appreciate. I’d love to include your note on the post if that would be ok? I’m sure it was no picnic working there. Unlike for us sauntering down the steps on a perfect spring afternoon. “Pleased to hear you were surprised to hear from me. I don’t normally respond to web orientated sites, but South Stack has always been a special place for myself and my family. The working environment there was always calm (apart from the odd rescue!) and relaxed, and although weekdays in summer could be busy with tourists, I always enjoyed them. Sundays would see the bridge gate locked, so we got the island to ourselves and could sit and read the papers from cover to cover. Each day, one or other of the keepers would go up those steps to fetch milk and papers which we had delivered to one of the local farms, so whoever felt the fittest, or decided he needed the exercise, was nominated! That was long time ago, and I went on to do a lot more years in the service, being one of the last men to leave it after completion of the automation programme in 1998, however, I am still very much involved with lighthouses to this day through the Association of Lighthouse Keepers. By all means use my comments on the post. 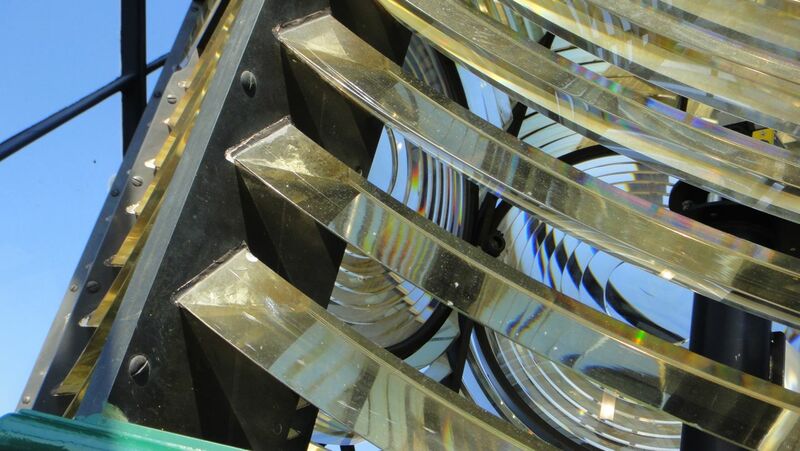 So this morning all thoughts of work have been put to one side as I’ve pored over the website of the Association of Lighthouse Keepers. Places to visit, lighthouses you can go and stay in, dreams still to be dreamed. 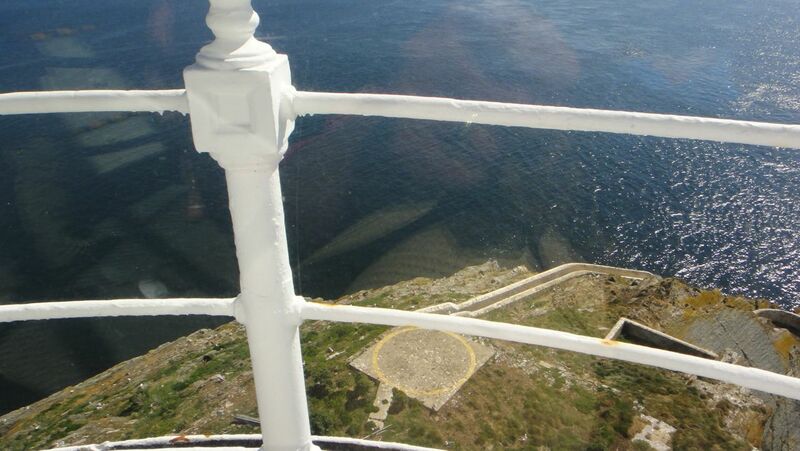 Refilled with that same sense of wonder you can see on my face up there at the top of the South Stack Lighthouse. Thank you so much for getting in touch Gordon. And of course ‘To the Lighthouse’ by Virginia Woolf. Heaven in a wildflower and Half-life? Oh Ronnie, How do you find these things? That lighthouse keeper’s hat looked a big for him though! Ha! It’s not the real Gordon Medlicott wearing his uniform in there. Superb. I would like to have joined the sea-kayakers you can see going past the lighthouse in the 7th picture down. 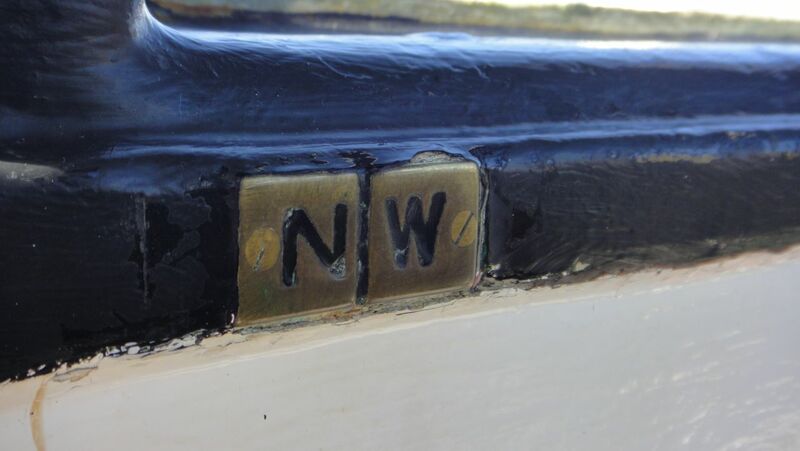 When I first went there, it felt like a different world – it seemed to take so long to get there and yet the information board told me that it is only about 75 miles from Liverpool – yet another important landmark for the hundreds of thousands of ships which have sailed to the great port over the centuries. Haven’t been to South Stack since 1974, I think – and we had a serious gale blowing in at the time and the rain was “falling” horizontally! Glorious photos, Ronnie. Real sense of presence there. Those lovely walled in bits of garden! Still, the gulls appreciate them! I adored jeannette Winterson’s book ‘Lighthousekeeping’ too. Look forward to the wild flower posts! Sarah took a lot of the photos on this one, and she’s at work on ‘Heaven in a Wildflower’ as we sort of speak! I like all of them but especially the watercolor pic and the lighthouse with the sun next to it. Nice going! Thanks Karen! Glad you enjoyed this. 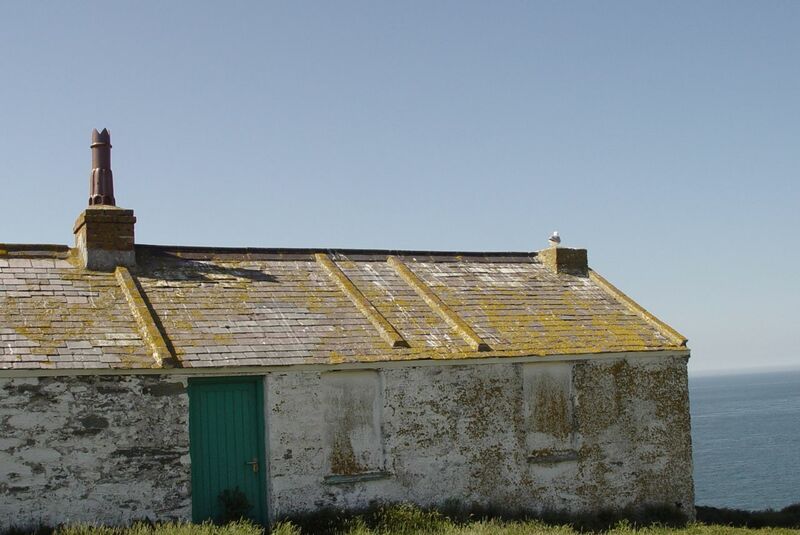 Yes there is a fascination about lighthouses and how the keepers and their families managed for long periods of time in those remote,mostly windswept places. The mechanics of the great lights shining with polished brass are amazing. Spectacular photographs and I wish I had been there…. 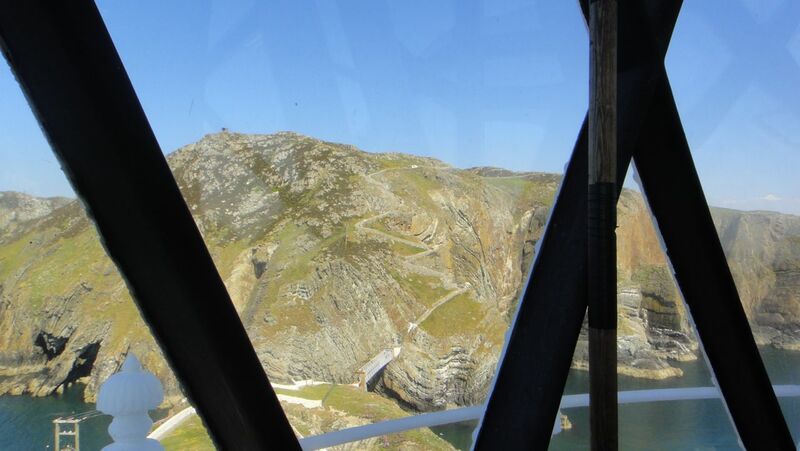 Just a correction to your comment about keepers being on South Stack for a month’s duty from 1935. In fact the system for rock and tower lights was two months on and one month off until (as far as I remember) the mid-1970s when it became a month on, month off. 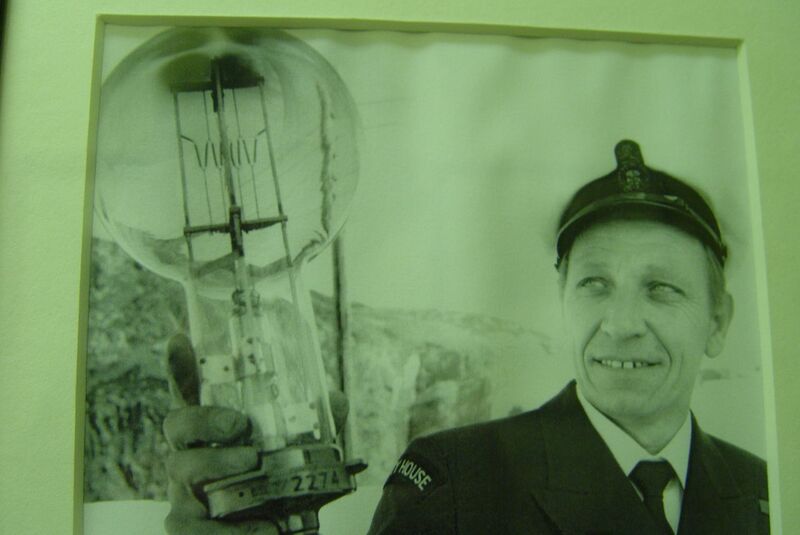 My father was Principal Keeper at South Stack until his retirement in 1980 and it was the last of the dozen lights he served at in thirty years as a keeper. Thanks for this David and good to hear from you.